In Lady Killer, Joëlle Jones and Jamie S. Rich have crafted a Space-Age crime fantasy that drips red, white, and blue (but mostly red). 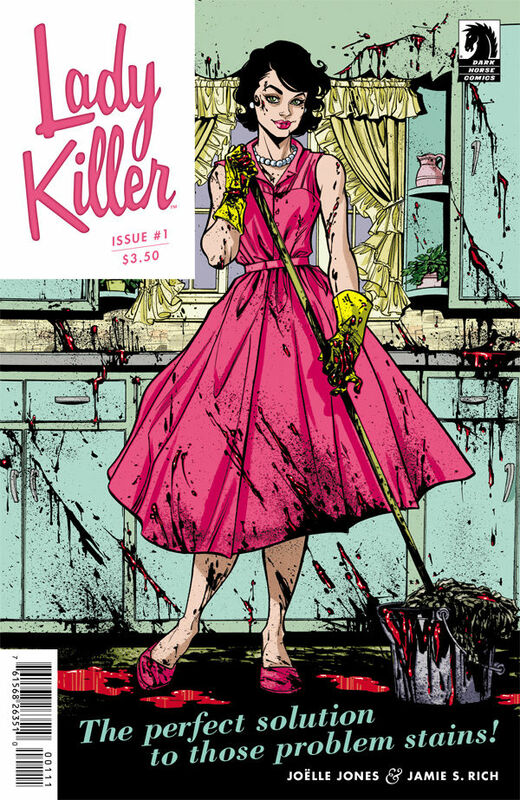 The first issue of Lady Killer opens as Josie Schuller – housewife, door-to-door make-up saleswoman, and professional killer – politely but firmly wears down the defenses of a new customer. Though the haggard-looking woman looks like she’d rather just have a moment of peace from her yapping dogs, Josie isn’t the kind of woman one says no to easily. Needless to say, this comes in handy throughout her many roles. 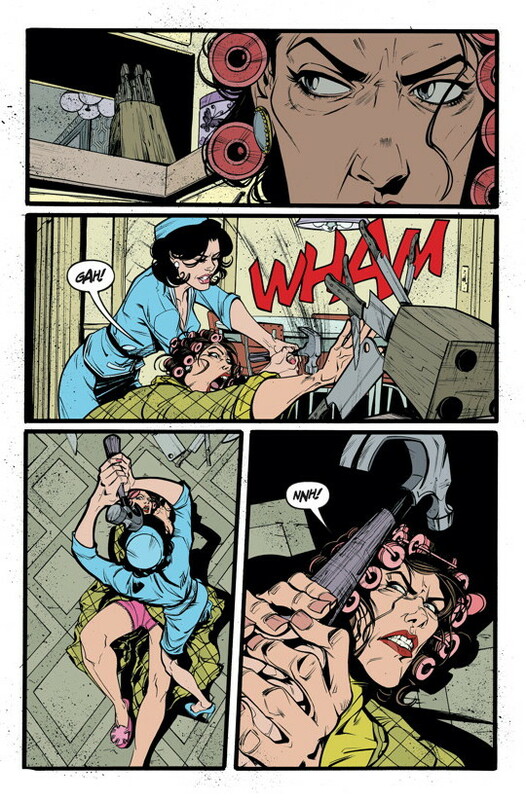 The concept of housewife-as-hitwoman echoes that of Garth Ennis and Adriano Batista’s Jennifer Blood, but collaborators Jones and Rich show what a difference one can make with the right execution. While Jennifer Blood skewed toward the gonzo side of Ennis ultraviolence, Lady Killer revels in the quiet moments, ratcheting up the tension to fever pitch. 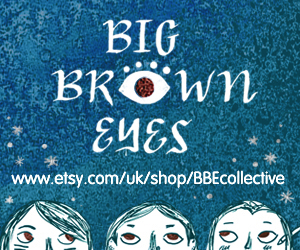 This first issue is a study in the power of restraint as well as the seductive thrills that come with giving into one’s passions. With her alluring style and confident demeanor, Josie initially seems perfectly capable of keeping the various parts of her world segmented. However, a disturbing moment during one of the messier parts of her job shows that Josie may not be as in control of her darker impulses as she seems. Of course, that’s what makes the decadent 1960s American setting of Lady Killer such a ripe breeding ground for tales of ambition gone wrong, mined previously by authors like Patricia Highsmith and Richard Stark (née Donald Westlake). Jones and Rich capture the feeling of a time when easy money and quick fixes were all around, but a more dangerous reality lurked just underneath. The shift from Josie’s wetwork to playtime with her young daughters only underscores her perilous position, and also raises more questions about the sequence of events that led her to the present day. Even at home, Josie seems like an outsider, standing out through visual cues like her family’s uniform golden hair and her husband’s patronizing admonition to his mother to speak in English (“You know Josie doesn’t understand German”). As the artist and co-writer behind Lady Killer (teamed once again with her You Have Killed Me collaborator Rich), Jones is free to let her fascination with vintage advertising and pin-up illustrations loose in a way unlike any before. Every page is bursting with details that bring life to the suburban 1960s setting, from the characters’ fashion choices to a cat clock on the wall. Laura Allred adds to the effect with her masterful coloring, which also shows a considerable departure from her psychedelic collaborations with her husband, Mike Allred. She instead draws on the color palate of the era to add to Jones’s grimy vision of the American Dream. By the end of this first issue, the team has thrown Josie into a situation that’s a far cry from her comfort zone—and that’s great news for readers. If you prefer your social commentary with an extra-sharp edge, Lady Killer offers plenty to savor.